Ever since electronic cigarettes hit the market, I've been hoping for a marijuana flavor e-juice. You know that crisp, fruity flavor you get with fine Dutch weed, that leaves you wanting for more, even when you've been totally stoned out. The high is great, I'm not complaining, but maybe I'm not the only one who wondered if it would be possible to get just the taste, without the high, so that I could keep on inhaling that delicious smoke all day long without any side-effects. Well, I want to share this with everyone… Recently I discovered an amazing vaping flavor, Blueberry from VaporNine, and it comes pretty close to delivering just that – sweet, citric taste of marijuana. Of course, it is just a flavor, there is no THC so forget about getting stoned. However, if you are like me, the morning joint kind of person, then I warmly recommend trying V9 Nebula with Blueberry flavor cartridge. In my case, it cut down my smoking budget in half. Until I started vaping Blueberry I wasn't aware that I was hooked on the taste, and not so much on the marijuana itself. Now I'm the joint in the evening kind of person, as long as I can vape my Blueberry Nebula throughout the day!If you already have an electronic cigarette, you may want to inquire if the VaporNine cartridges are compatible with it. If not, don't think twice about purchasing their e-cig Nebula and a bunch of Blueberry Flavor cartridges to go with it! 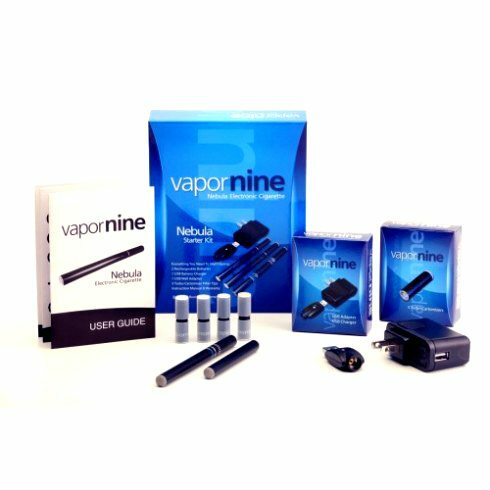 V9 Nebula has great reviews and is one of the most economical e-cigarettes, with complete Starter Kit for just $69.00. I got 10% off my order with this coupon code: V95059M. If you decide to shop, make use of it! It would be interesting if the flavor could induce a placebo effect high? 19.99 for starter kit? one bat one carto? LOL. RIPP OFF. these us and uk assholes buy from china slap on their name and triple sometimes more the price! LOL DO NOT BUY FROM THESE VENDERS ALWAYS ALWAYS ALWAYS BUY E CIG STUFF FROM THE MANUFACTURER OR THEIR SUPPLIERER NOT THESE FOURTH OR FIFTH RATE SCAM ARTIST MIDDLE MEN WITH NO REAL EDUCATION OR JOB. I don’t know about the taste of marijuana as i never smoked it but i am sure a lot of people will be delighted to have this new flavor. Great news for those who smoke marijuana now they can have the same taste with electronic cigarette. You can get marijuana flavored e juice quite easily these days, although I’m not sure how it compares to the real thing.